Talking about a hipster cafe, I guess ReStore Living will be my top 3 selections thus far (Hopefully I did use the word “hipster” appropriately). This is also among one of cafes located within the district of Tanjong Pagar. This cafe is generally a place for patrons who will like to purchase or simply admired vintage furniture that have been lovingly restored. The furniture in the cafe are given a good polish, restoration of wood, reupholstered to bring back their former glory. 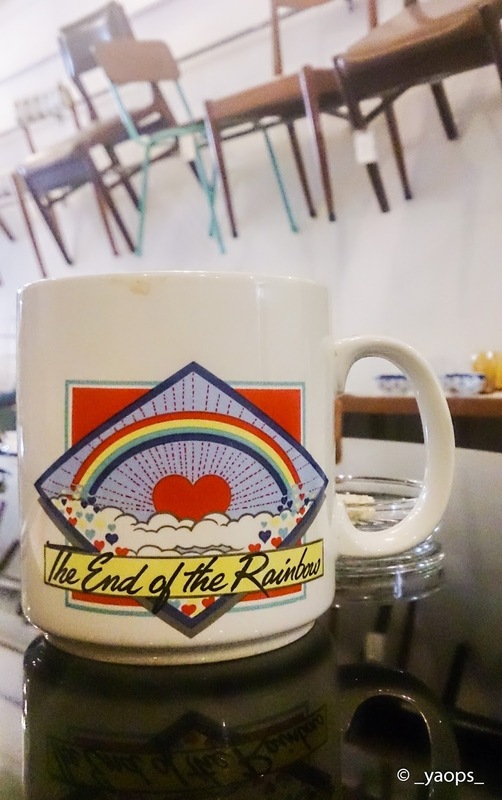 ReStore is a nice and cozy cafe where you can wonder your mind while having a cuppa and dessert served on a vintage table, seated on a vintage chair and be surrounded by vintage furniture. I ordered a latte and Kelapa which is waffle drizzled with gula melaka and shredded coconut and accompanied with freshly whipped cream. To me, the latte was medium-heavy in body, but couldn’t identify much of it’s flavour as it was “drowned” by its plain bitterness. Nevertheless, both were satisfying and palatable. On a side note, even the cup and plate were has vintage design on them. Backdoor. 3 time period of Singapore.